Pickles aren’t just for pregnant women 🙂 Dill pickles are a great ‘condiment’ in my opinion. They go great on a veggie tray, a sandwich, in salads, or just to eat plain! 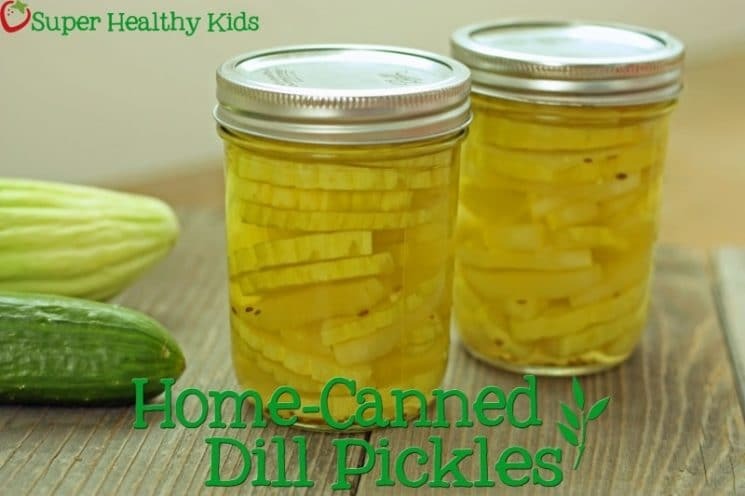 Pickles are just another form of a veggie to introduce your kids to different flavors, and textures. This recipe makes a crunchy, tangy pickle with ingredients that you can pronounce all of the names of! To make these pickles begin by slicing your cucumbers. You can use pickling cucumbers, but if you just have regular, those will work good too! I slice mine about 1/4 inch thick. Place your sliced cucumbers in a large bowl of ice water. Cover and put in the fridge overnight. This is what helps to make then super crunchy. Once they have soaked in ice water, drain and then pack into your jars. If you haven’t ever canned at home before, this is a great Canning Basics to read through first. Next you will combine vinegar, 2 Tbsp salt, sugar and 1 quart water in a pot. Add mixed pickling spices tied in a clean white cloth. Heat to boiling. In each jar add 1 tsp mustard seed and 1 1/2 heads of fresh dill (for a pint jar). Pour your boiling liquid over the top leaving 1/2 inch headspace. 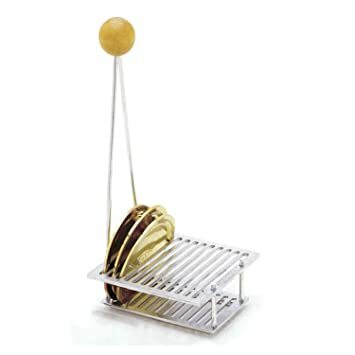 I found this awesome lid lifter on Amazon. Instead of putting them in your pot one at a time, and then getting them out one at a time, you can do them all at the SAME time! It has changed my world. That is it! If you are like me and have a million cucumbers, this is a great way to preserve them. I always grow Armenian cucumbers which are super crunchy, and non-bitter no matter what size they grow to. 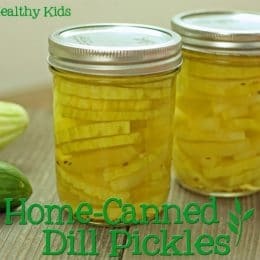 They have a much lighter color than other cucumbers, and so turn a vibrant yellow when they are canned. If these are properly canned, they will stay good for up to 1 year. Now that I can all my own pickles, it is hard for me to go back to eating store bought! 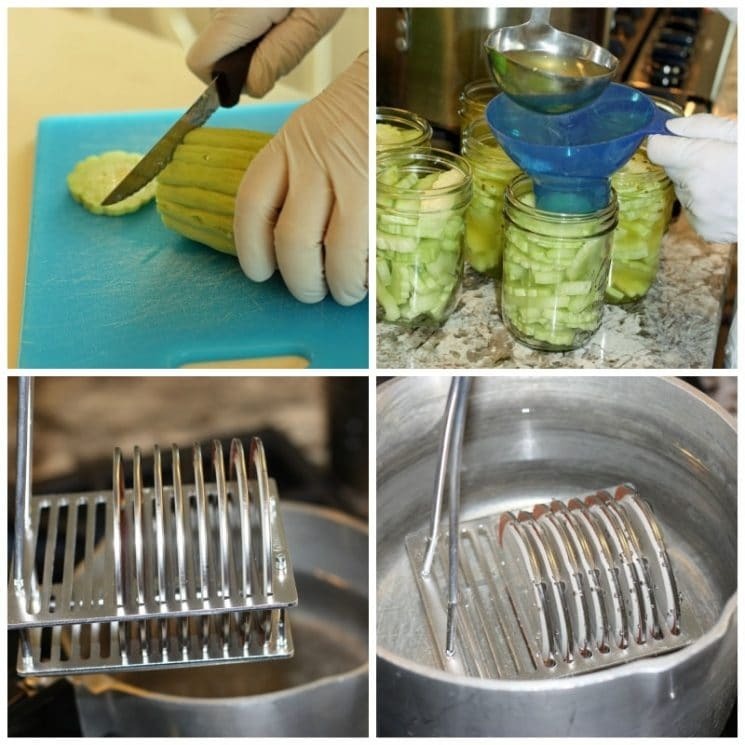 Rinse cucumbers and slice to 1/4 inch thick. Combine vinegar, 2 Tbsp salt, sugar and 1 quart water in a pot. Add mixed pickling spices tied in a clean white cloth. Heat to boiling. In each jar add 1 tsp mustard seed and 1 1/2 heads of fresh dill (for a pint jar). Pour your boiling liquid over the top of your cucumbers, leaving 1/2 inch headspace. Adjust lids for each jar. Is pickling spice the same as pickling salt? This winter I want to get back into making Kombucha, Sauerkraut, and pickles. Yum!! Thanks for the recipe. When I make pickles, or pickle jalapenos or okra or green beans, I don’t even mess with the water bath. I also don’t use pickling spices. WAY TOO MUCH SALT. I pack my jar full of crispy cukes (or whatever) and add smashed clove of garlic, fresh dill, a pinch of sea salt, a jalapeno (if you like them spicy like I do) etc. Then I boil the heck out of the vinegar, pour it into my jar and close the lid. 99% of the time it “pops” and make the seal tight. I have NEVER had an issue with a bad batch and they turn out so much crispier than when you do a water bath or pressure can them. Emily, do you store them in the fridge or the cabinet after that? Could you make the dills from whole cucumbers about an inch/inch and a half around and four to five inches long? No it is not the same. Pickling salt is actual salt that is used for canning because it does not make the liquid in your jars cloudy.